Verdict: Elegant choice for full size MicroATX HTPC project. 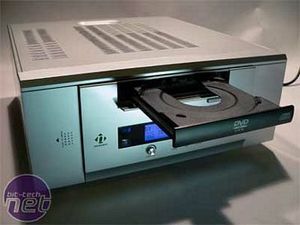 The HTPC (home theatre personal computer) genre is in full swing in 2005. A quick scan of the floor at this year's CES show in Las Vegas showed more and more manufacturers catering to the merging of personal computing and traditional media entertainment. All the top players are represented: Antec, Ahanix, CoolerMaster, Silverstone, the list goes on. I have been a fan of this PC subculture for some time as you may tell since two of my custom mod projects for bit-tech have been HTPC's. With WindowsXP Media Center Edition within reach for the rest of us who would rather "do it ourselves" there's even more motive. So when I came across a new model of case from a company I have yet to hear of, NMEDIAPC, I had to take a look. First glance shows a lot of potential but only a closer look will tell for sure. Looking to add an HTPC to your living room but struggling to find a decent case for the happy side of £150? The Lian Li PC-C32 might be the answer, offering support for full size ATX components and plenty of noise reduction features. We find out if it's worth sitting below your TV. This is the Antec MicroFusion 350, the micro ATX little brother of Antec's awesome Fusion HTPC chassis. Although the case has had a face lift, the Fusion styling is still there, but why does opting for less case mean you have to pay more money? We built a PC inside it to find out.